Newcastle United – News Roundup – 03 August 2009 | NUFC Blog. The weekend has of course been largely given over to the sad death of Sir Bobby Robson and the rest of the news seems less important now. However I’m going to try and catch up a bit today. In our final pre-season friendly we managed a 1-1 draw with Dundee. Our goal came from Andy Carroll and then Dundee equalised from the penalty spot late in the game. There are reports on the club site and on Sky Sports. “It is not true. Not since I have been here today. “He is a player that I was interested in. 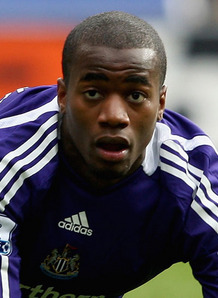 I like Bassong, he is a young player with a good future and a good central defender. “The first I heard about it was when I saw it on television this morning. “I haven’t spoken to anybody since then. It’s just speculation as far as I’m concerned. “At this moment, they are all Newcastle players. “What happens in the future I don’t know, but at this moment they are all Newcastle players. “It was never my intention for me to play Bassong, he is suspended for the first game of the season. And it now appears that Manchester Moneybags have entered the race for Bassong. According to the Daily Mirror a deal could be done in the next 48 hours. Hardly the most revealing of insider snippets. “To hear him handing in a transfer request it shows the intention that Habib Beye wants to leave Newcastle first and foremost. “Two, that he knows of our interest, and three that the transfer valuation for him is something that we’re not prepared to go to. “But I’ll emphasise it again, who do you deal with at Newcastle? Is it the chief exec? Is it the chairman or is it a manager? According to the BBC, Bristol Rovers have signed keeper Fraser Forster on a month long loan and are hoping they can sign him for longer after that. “At this moment that’s what I’ll be doing, talking about the match which is live on television. The article also suggests that Keith Harris is negotiating with an unidentified foreign buyer, thought to be a financial services company, but apparently ‘sources close to the deal’ admit there’s a strong possibility it won’t go through. I might just be a bit oversensitive following Sir Bobby’s death but I’m finding all this selling the club business a bit tedious now. It seems to me that Ashley’s asking too much money and his chances of selling it this year are looking slim. He seems to be expecting his buyers to show the same lack of diligence he showed when he bought the club, but most buyers simply aren’t that reckless. Either he needs to drop his asking price or he’s going to have to knuckle down and accept he’s stuck with the club for now, in which case he needs to pull his head out of the sand and start dealing with things. The Times reports that restructuring experts have made unsolicited approaches to Ashley in case he can’t sell the club but Ashley is refusing to speak to them. Instead Ashley is trying to tempt buyers by offering loans of up to £40m to take the club off his hands before the season starts. Ashley may not care in the slightest about Newcastle now but sometimes we have to accept responsibility for the things we’re charged with and just get on with them and do the best job we can, which is what Ashley should be thinking about now, whether with the help of a restructuring expert or not. What he needs, in fact, is a kick in the pants. I don’t understand this bit, Hugh. Surely if prospective purchasers are showing the diligence that Ashley didn’t, the sale will be a long, drawn out, tedious process? Which, of course, it is! Ashley will almost certainly be anxious to bail out of the NUFC disaster ASAP, but I haven’t really seen any eviidence that he’s been “expecting his buyers to show the same lack of diligence he showed when he bought the club”. I think Ashley expected a much faster sale at his £100m asking price. But I’m guessing that the current prospective buyers are taking a more diligent approach than Ashley expected (or would take himself) and are considering things like wage bills, knock-on transfer fees, restructuring costs etc. in much more detail and as part of a longer-term plan. This, I believe, has come as a shock to Ashley, hence his desperate attempt to persuade buyers by offering £40m loans. I’m thus speculating that Ashley expected buyers to be less diligent – maybe not actually as reckless as he was but certainly less picky than they have been. I don’t get what Phil Brown is on about here? I know you are without a manager but why the confusion – Surely all the bids should go to Mike Ashley as the players remain his assets? Where is he anyway? I haven’t heard anything from him in a while and no one seems to be able to communicate with the club. Very strange situation all round! I think what Hugh is trying to say is that because Ashley didn’t do any due dilligence he was lumbered with a club in a terrible financial situation and he thinks the only way he will sell the club is to another billionaire who’s as hasty as he was. I mean I wouldn’t pay £100m for NUFC knowing that in the PL we were losing £30m a year so it will be more than that this year with the projected turnover shrinking by about half. I fveel sure he will have to reduce the asking price by 50% to even get serious interest. That’s were FFS comes in as he has bid about that.